During our January 2016 trip to Haiti, we held a Kanaval Photography Workshop with a handful of our advanced students from ACFFC (Art Creation Foundation for Children) in Jacmel – Andre Wilner, Fedno Lubin, Djecilia and Jeff Jean Baptiste, Lineda Marcelin, Michel Herode, Pierre Louis Mackenson, and Pierre Meristene. Djimmy Desulme from Cite Soleil also participated shooting the Port-au-Prince festivities. The photographers were working on building their portfolios, and learning more about photographing big events. The challenge was to shoot clean shots amid the chaos, and I’m very proud of how my students tackled the assignment! 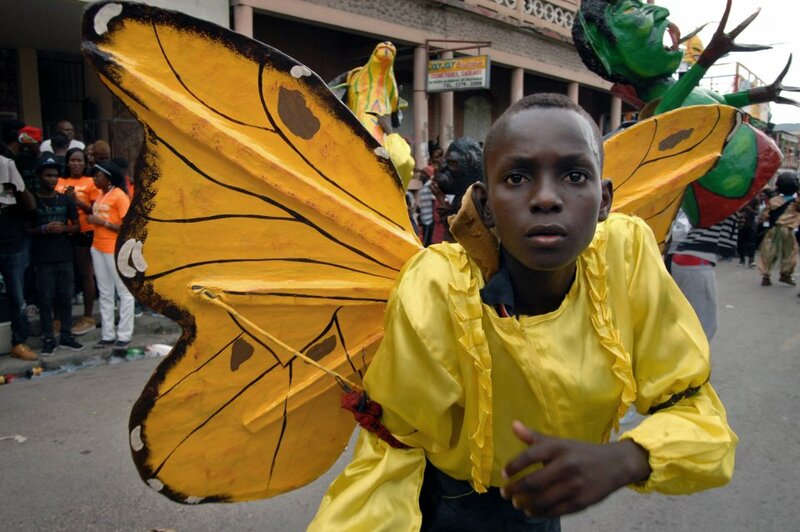 Click on the Butterfly Boy to check out the photo gallery. ← Previous PostOur biggest Ti Maché (Little Market) of the Year – November 28 & 29, 2015 in Berkeley, CA!